Infantino hails Qatar’s progress on infrastructure ahead of its 2022 World Cup and said the tournament is poised to be the best one yet. France may have won the 2018 FIFA World hosted by Russia, but attention is now shifting to the 2022 edition. FIFA President, Gianni Infantino is excited about the next world cup to be staged in Qatar. Infantino hailed Qatar’s progress on infrastructure ahead of its 2022 World Cup and said the tournament is poised to be the best one yet. Qatar’s tiny size, high temperatures and lack of ready stadium infrastructure have prompted some to question FIFA’s decision to make it host. But the desert state has since launched huge construction projects and promised to complete seven new stadiums by 2020. 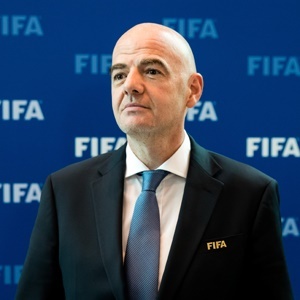 “You can see the progress which is being made here four years before kickoff,” Infantino who spoke during a visit to the next host nation on Tuesday said. This was via a statement from Qatar’s local World Cup organising committee, after the FIFA head toured the 40,000-seater Al Wakrah stadium. “The Russian World Cup has been the best ever but the World Cup in 2022 in Qatar — I am sure — will be even better,” Infantino added. The next tournament’s logistics were further complicated last year when Saudi Arabia, Bahrain, the United Arab Emirates (UAE) and Egypt cut diplomatic, transport and trade ties with Qatar. They had accused their regional neighbour of financing terrorism, a charge Qatar denies. Qatar has nonetheless said it was pushing ahead with ambitious infrastructure plans to host the World Cup, which was the centrepiece of Doha’s strategy to project itself on the global stage. It has since inaugurated a $7.4 billion (£5.7 billion) port and expects to open its first metro by the end of this year. The 2022 FIFA World Cup is scheduled to be the 22nd edition of the FIFA World Cup, the quadrennial international men's football championship contested by the national teams of the member associations of FIFA. It is scheduled to take place in Qatar in 2022. This will be the first World Cup ever to be held in the Arab world and the first in a Muslim-majority country. This will be the first World Cup held entirely in geographical Asia since the 2002 tournament in South Korea and Japan (the 2018 competition in Russia featured one geographically Asian venue, Yekaterinburg). In addition the tournament will be the last to involve 32 teams, with an increase to 48 teams scheduled for the 2026 tournament. This will also mark the first World Cup not to be held in May, June, or July; the tournament is instead scheduled for late November until mid-December. It is to be played in a reduced timeframe of around 28 days, with the final being held on 18 December 2022, which is also Qatar National Day. Don’t forget to share this article with your friends and family.